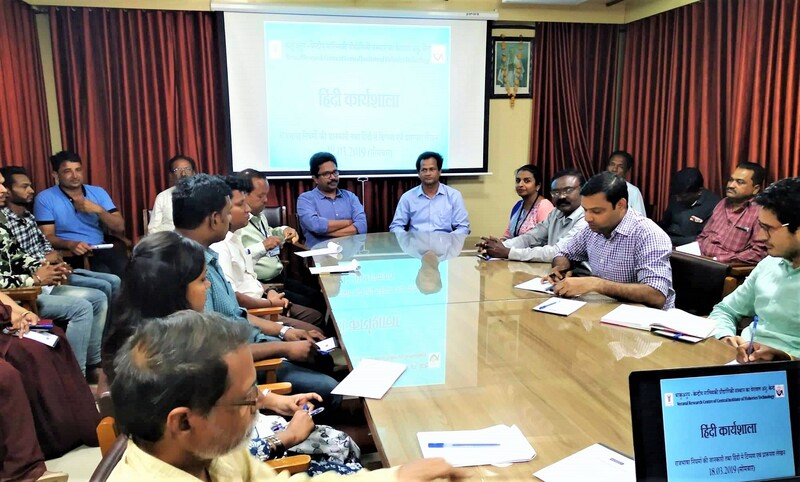 As part of implementation and promotion of Official Language in Veraval Research Centre of ICAR-Central Institute of Fisheries Technology a one day workshop on ‘Official Langugae Policy & Noting and Drafting in Hindi’ was conducted on 18 March, 2019 by Dr. D.D. Goud, Hindi Officer, Office of the Principal Accountant General (G&SSA), Rajkot. Inaugurating the workshop, Dr. Toms C. Joseph, Principal Scientist & Scientist-In-Charge of the Centre stressed on the importance of Hindi in governmental work. Smt. Nimmy S. Kumar, Technical Assistant (Hindi Translator) welcomed the chair and the audience. The interactive workshop had 29 participants. Dr. Goud created awareness about the importance of Official Language in our official work. He also guided the participants with various guidelines to attain the target percentage in the official language correspondence. He also emphasized on important and frequently used words and phrases in Noting and Drafting and discussed about the possibilities and limitations of Official Language in official works. Further, he suggested the simplified usage of Hindi words so as to smoothen the functioning of official Language usage. The workshop concluded with an inspirational decision by the staff to give their best for the progressive official language implementation.